To get your name in for the giveaway of The House by J. Patrick Lewis and Roberto Innocenti. Sign up here! Done? Purr…fect. Now, curl your paws and lick your whiskers, because today’s poet brings us some furry verses guaranteed to make you blink slowly but knowingly! The author of over two dozen books for children and teens in every genre there is, Lee has won a litter box full of awards and honors, including the 2012 Lee Bennet Hopkins Poetry Award for her most recent picture book, Won Ton: A Cat Tale Told in Haiku . Why I Like Love This Book: A “tough” Siamese cat with a huge personality + funny verse + witty and wonderful illustrations + an endearing story = perfect picture book! Okay, here’s a sneak peek at one scene…just look at that poor kitty behind bars! Bed. Bowl. Blankie. Just like home! Latch squeaks. Door swings wide. snags, clings to what’s known. Wait! Let me back in! bake it with a nap. Lee: who are you, where are you, and how long have you been a rhyming fool? I wrote my first poem – a haiku – in third grade. (I suspect that every public elementary school in the 1960s was required by law to teach haiku as a way for children to learn syllabification.) I penned my first rhyming poem soon after; it was called “The Midnight Ride of Mouse Revere” (The cats are coming! The cats are coming! ), and I’ve been hooked on poetry ever since! As to who I am: I’m a girl (a woman, actually), even though my first name is Lee. (I get a lot of fan mail addressed to MISTER Lee Wardlaw!) 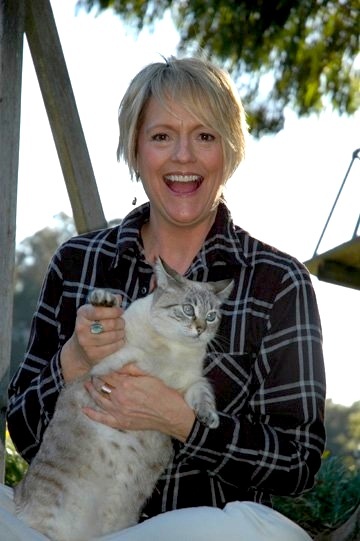 I live in Santa Barbara, CA, with my husband (a surfer and winemaker); our teenage son, Patterson (a voracious reader who is annoyed that I write picture books and humorous contemporary novels instead of stuff like Harry Potter, The Maze Runner, or The Hunger Games); and our two former shelter cats. The latter are fond of leaving lizard and gopher parts on our back door mat for me to step on in my bare feet. My main job in life, other than writing books and embarrassing my son, is serving as the official door opener/closer for our cats, who when they are in, want out; and when they are out, want in. One time a little black cat followed me home, and I only had to call it 1,256,721 times. Was it a similar experience that inspired you to write Won Ton? And why did you choose to write this kitty’s story in haiku/senryu? Are your other PBs in verse? HA! That’s how my brother convinced a Siamese cat to come home with him when I was in fifth grade. The cat came complete with a powder blue, bejeweled collar. We named him Kiki. He was weird. He ate wool. When he polished off the pockets on my winter coat AND a portion of my mother’s new drapes, Mom took him to the Humane Society. Three of my picture books are in rhyme (Peek-A-Book , Saturday Night Jamboree, and First Steps), but Won Ton is my first book told in a series of linked poems. We adopted “the one” – a cute striped Tabby with an orange tummy – and brought him home, where he skittered under a bed and hid for two days. Patterson lured him out at last by dangling a shell lei, so we ended up naming him (the cat, not my son) Papaya. It was a slow process, but as the days and weeks passed, Papaya gradually adjusted to his new surroundings. Soon, he and Patterson became comrades-in-paws – snuggling together under blankets, reading together, playing “Chase the Ping-Pong Ball,” even lapping out of the same cereal bowl! – and I had a great idea for a new picture book. But how best to tell the story of a boy, his cat, and their growing friendship? At first, I tried traditional prose – too humdrum. Then I tried rhyme. Too cutesy and too young: I wanted this book to appeal to all ages. Among the more than two dozen children’s books you’ve written are nine picture books. I can’t imagine they’re all about spunky kitties (though that would be fine by me!). Can you tell us a bit about the subjects that make you purr with inspiration, and how you first scratched your way to publication? The first picture book I ever sold was Tales of Grandpa Cat , illustrated by the late New York cartoonist Ronald Searle. Grandpa Cat was not (surprise!) inspired by a cat, but by my maternal grandfather, who was the Best. Storyteller. Ever. I’ve done one dog story, too (much to the chagrin of our dog-disdaining felines): Bow-Wow Birthday , which was inspired by a party I attended for a canine who was turning 100 (in dog years!). The catalyst (no pun intended) for the majority of my picture books, though, is my son. Watching him learn to walk inspired First Steps; his habit of making mealtime a full-body experience (complete with oatmeal on his head) became The Chair Where Bear Sits ; and our bedtime routine turned into Peek-a-Book. What is your favorite part about being a children’s writer, other than receiving a warm bowl of milk and a scritch behind the ears (as if those weren’t reward enough!)? 1. Going to work in my kitty slippers. 3. Meeting my fans at school visits. 4. Creating characters who I think would be fun to meet in real life. 5. Working at home so that I can take a nap every day with my cats! 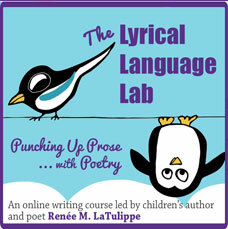 Do you have formal training in writing poetry/PBs? No formal training, although I’ve taken a couple of small writing workshops and classes from children’s poets, such as Ann Whitford Paul and Ellen Kelley. And I read, read, read a lot of poetry. What’s your best advice for kids who want to write poetry? Read, write, repeat. Read, write, repeat. What’s your best advice for poets/writers who want to get their poetry (or rhyming/verse PB) published (other than “don’t bother”)? Can you recommend a particular book of children’s poetry, or a particular poet, that you think children should read? Why that book or poet? Well, just about anything by Lee Bennett Hopkins, of course! I also love the work of Kristine O’Connell George…and Valerie Worth…and Thalia Chaltas (her YA novel Because I Am Furniture is powerful and poignant) and Joan Bransfield Graham (her shape poems are fun!) and…I could go on and on. A great resource that I highly recommend is Poem-Making: Ways to Begin Writing Poetry by Myra Cohn Livingston. Yes, please stop by! I guarantee cat fur on your sweater! I have stuff on my site for teachers and librarians and children…oh, my! The site will be revamped this summer, with info for parents, too. I have teacher’s guides available for almost all of my books; I even have a recipe for my famous Kitty Litter Cake! Kids should click on the Just for Kids icon on my home page; there, they’ll find ongoing contests, recommended books, and other resources for young writers; info about me, my life, and my books (suitable for book reports! ); and 101 Ways to Bug an Author (a.k.a. ME!). Thanks for stopping by, Lee, and for adding furry tufts of Won Ton to No Water River’s growing video poetry library! Thank you for inviting me! Lee provides a comprehensive cross-curricular Won Ton teaching guide that includes discussion questions, activities for language arts, math, and science, ideas for a community service project, and a guide on how to write haiku. There are many wonderful resources for philanthropy education, including an excellent animal shelter unit plan at Learning to Give; dozens of animal unit plans and volunteerism ideas at Cochrane Humane Society and the Humane Society of the U.S.; and high school lessons at Pearson Foundation. For younger kids, try the preschool cat theme at First School and cat activities and crafts at DTLK and Artists Helping Children. Make Lee’s pawsome kitty litter cake! Some of Lee's many books! stops in on Monday to send us off in style! Video Location: Kitty-Cat Central, first stop on the Tabby Town Line, Santa Barbara, Catifornia! 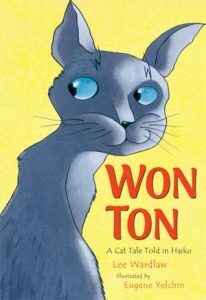 Selections from Won Ton: A Cat Tale Told in Haiku copyright © 2011 Lee Wardlaw. Published by Henry Holt and Company. All rights reserved. I loved hearing Won Ton come to life via Lee. I only wish we could see her in those cat slippers reading the poems! Thanks, Renee and Lee, for the vid and interview…. I’m so happy to add this book to the PPBF list, because it really is special. 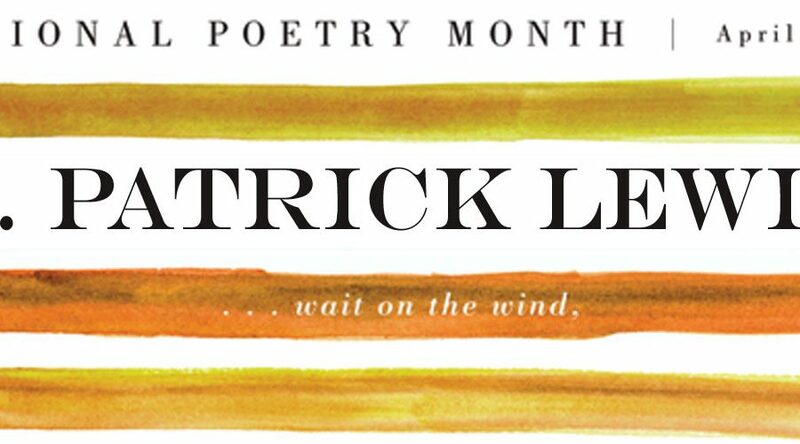 Oh, and Lee originally did the reading for Poetry Month … but my little gears clicked on and I realized this would be good for PPBF too! Well I think this has to to be THE definitive Lee Wardlaw & Won Ton post. You covered everything, and that book is so good! if only I was a cat person… kidding. I love Won Ton even though it’s not about a chocolate lab. Did someone say chocolate? Oh…chocolate lab. Not edible — but very cute! So exciting hearing Lee read these poems. Love Won Ton! Lee will be sharing a new kitty senryu at the Poetry Potluck on Monday :). Oh, that’s great, Jama! I’ll be over to see what purr-fection she cooks up at the potluck! When Grace and I read this book together we did not read this aloud properly, so we will try it again! Penultimate post Renee and Lee – really terrific. How was the name “Won Ton” selected I wonder? I know!! I just commented on FB that I can’t stop saying “letmeOWtletmeOWtletmeOWt”! Shame on me, I didn’t even think of reading it that way, and I just love it. The cat’s not thrilled with Won Ton at first either (or so he says) – he doesn’t want to be named for soup! Thank you, Lee, for this wonderful post and the backstory. I’ve been owned by many formerly homeless cats over the years. My office kitty May would like to pass on that she very much enjoys your work. Mrrowww. “Won Ton” is absolutely brilliant. I first heard about the book on Katie Davis and knew I had to have it for my cat-loving niece. Congrats to Lee on all her successes. And Renee, thanks for sharing her story. And Won Ton keeps raking in the awards, too! The LBH Award is just one of many. This is indeed a special kitty. Paw, shucks! fangs a lot, everyone! This was very fun – – despite the fact that I hate seeing myself on camera. *Children often don’t know the difference between Japanese or Chinese words, so when I put myself into the mindset of a young boy who is trying to choose an appropriate name for his new pet – – whom I envisioned as being a type of Siamese – – Won Ton was one of the first things that popped into my head. (My own son loved won ton soup starting at about age 2 or 3.) That’s one of the reasons Won Ton is so affronted by this name; HE knows that his real name (which you don’t learn until the end of the book) is Japanese, whereas ‘won ton’ is actually Chinese. *My dad had a chocolate lab years ago. Her name was Hershey Bar! She was deliciously fun and full of energy. She is the inspiration behind the dog in the companion title to Won Ton that I’m revising at the moment, which is called Chopstick. In this book, Won Ton gives his honest opinions when his family adopts – – horrors! – – a canine. *I’d meant to show my kitty slippers on the video, but I couldn’t find them! I expect I’ll find them under a bed, covered in dust bunnies and cat hair. 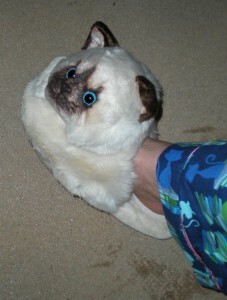 Our cats tend to chew on the slippers’ whiskers. I’ll make a point of posting a picture of me on my facebook page wearing my cat pj’s and slippers on my facebook page. (BTW, Renee advised me to wear a solid color, if possible, when filming my video; the kitty pajamas are quite ‘busy’! *I have a pair of cat ears, too, but they give me a terminal case of Bad Hair Day. Maybe next time! HA! Thanks for all the extra insights, Lee! I too heard about Won Ton on Katie Davis. I have it on hold at the library and can’t wait to have it in my hands. As usual, Renee, you did a fabulous job on the interview. It was so fun. was just the best. I will be saying it over and over all day. How genius! My granddaughter loves cats, so I must get this one for her upcoming birthday. What a fabulous book! Loved the shelter idea. Letmeout,letmeout was absolutely brilliant. It sounded like a meow! Lee are entertaining on camera! Renee, your interview with Lee was very enlightening and helpful. I enjoyed hearing talk about her process. Well done, Renee and Lee. What a fantastic post! As a person with 5 cats (we live in the country, and people just drop them off), I could not agree more with Lee – CATS ARE HAIKU! I truly enjoyed this reading and interview. Many thanks to both of you! I love that “people just drop them off” — and you keep them all! Working in slippers is my favorite part of being a writer, too 🙂 Great book selection, great interview. Loved it all! A good suit of pajamas is all we need! 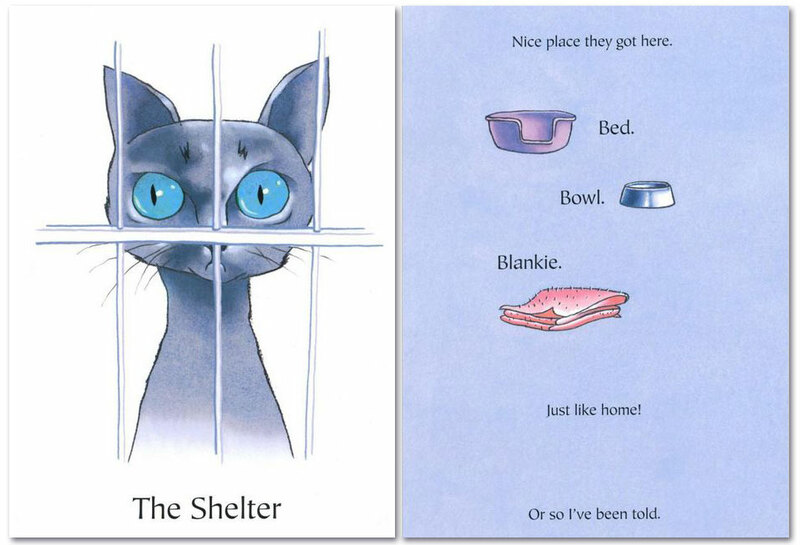 Very fun-lots of cats are waiting at shelters! Perhaps the success of this wonderful book will encourage people to find their own Won Ton, Lee. It’s a great story, & now I know how (as everyone has said already) to read it properly. Thank you, & thanks again Renee for a wonderful Poetry Friday post. Both of my kitties came from shelters, and they were the best! I miss them. Meow. This was a very fun video of Lee! Loved your expression on “Let me out!” I enjoy haiku so I can’t wait to read your book! Your kids will love this one, Tina! Love this book of Lee’s and most especially love her way of always looking at life through the eyes of a poet. Thanks for another great installment in this fabulous series, Renee. It’s true, Susan. Lee is such a bright spirit — a sprite! Hello, Myra! Yes, you should come by every Monday, indeed! Thank you so much for your kind words – you really made my day. Now go get Lee’s book — I guarantee it’s a purr-fect read! 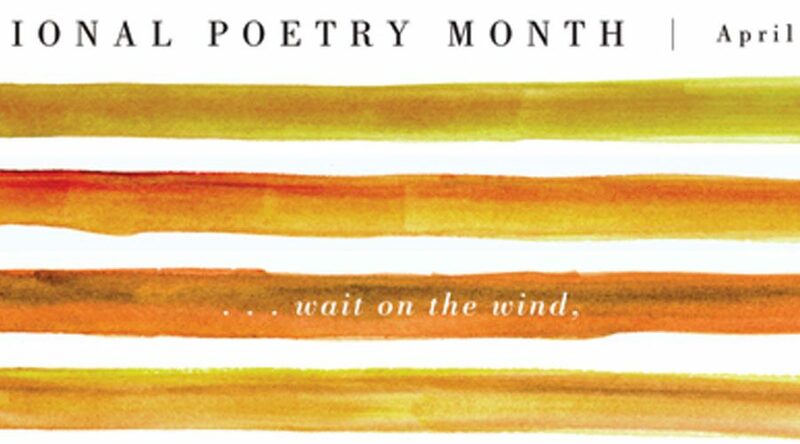 Between No Water River and 30 Poets/ 30 Days April should be called the Lee Wardlaw month. Personally I wouldn’t have have a problem with that at all. This book sounds so fun. I have it on my list at the library. Continues to wait patiently. You ladies are the cat’s meow! Thanks for the purrfect poem and interview. I was in such a hurry to check and make sure my name was down for the giveaway way back when, I clean forgot to leave a comment here… dah! I love cats and this was just wonderful. Loved the video as always. Lee is an awesome writer and speaker. I’ve read this post and if I could I wish to suggest you some interesting things or advice. Maybe you can write next articles referring to this article. I wish to read more things about it!